A winner in the north on Saturday and a treble at Salisbury on Sunday as Sixties Icon proves yet again that he's a sire of true value and first season sire Heerat produced his first two year old winner. On Saturday it was David Hudd, Chris Wright & Ann Black's KINKS who was most definitely not like everybody else as he and Charlie Bishop powered home in the five furlong novice auction stakes by over two lengths ahead of Brocklesby second Broken Spear with the rest a long way in arrears. The son of Sixties Icon & resident Norman Court Stud mare Crazee Diamond was shouldering a six pound penalty for his previous victory at Bath only a week ago but he showed that he's above average and Mick couldn't be happier as he plans his next steps and a tilt at black type. "An absolute smasher whose dam had a Swiss Spirit filly on the same day funnily enough. He is a star and has the looks and attitude that has got us all a bit excited with Royal Ascot creeping into everyone's mind. "There's a Listed race at Naas that we'll have a look at now because he deserves his chance at that level. After that we'll know where we stand in terms of the two year old picture. Chuffed with him - he trains himself, a real pleasure to deal with." On Sunday the Boss headed to a rain sodden Salisbury and it led to a treble at what, for Mick, is very much home territory. First up it was his very own COTUBANAMA who won the juvenile fillies' conditions stakes in partnership with Charlie Bishop as they took their time in the very heavy conditions to score by a length and three quarters, making the most of the experience the daughter of Heerat gained on debut at Newmarket a fortnight ago. She was third that day and the penny only dropped late on, finishing in eye-catching fashion. 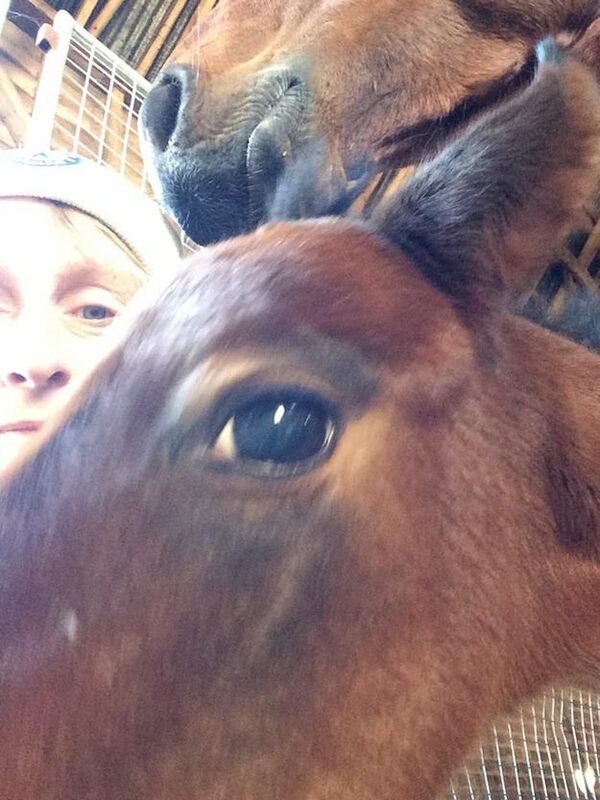 As owner, breeder and trainer, Mick was obviously delighted that she's improved for the run. 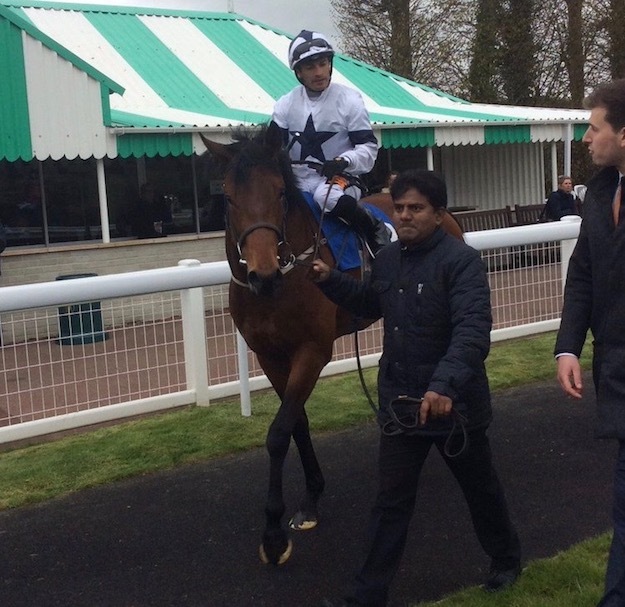 "This is one tough cookie and I'm delighted for Mickley Stud that Heerat is off the mark. We've got a few Heerats, one is a smashing yearling out of a mare called Paaches who had plenty of boot but never fulfilled her potential because of injury. The dam of this one, Saona Island was very similar. She never even made it to the track but she didn't half go well at home - luckily her daughter has boot too and she could be decent. "Again, I'm not going to get carried away but we've got a half sister by Sixties Icon as a yearling and Saona Island is due anytime now with another Sixties. It goes without saying that I'd love COTUBANAMA to be a black type filly." The second winner of the day was The Further Folly Partnership's WESTBROOK BERTIE who broke his maiden at the fifth time of asking under Silvestre de Sousa in the Class 4 three year old handicap over a mile and a quarter. WESTBROOK BERTIE showed plenty of ability at two and was unlucky on occasions, not least at Brighton last October when he was brought down and splattered David Egan all across the downs, but that is now a distant memory as the son of Sixties Icon virtually made all in a trappy four runner contest, accounting for the warm favourite First Eleven into the bargain. 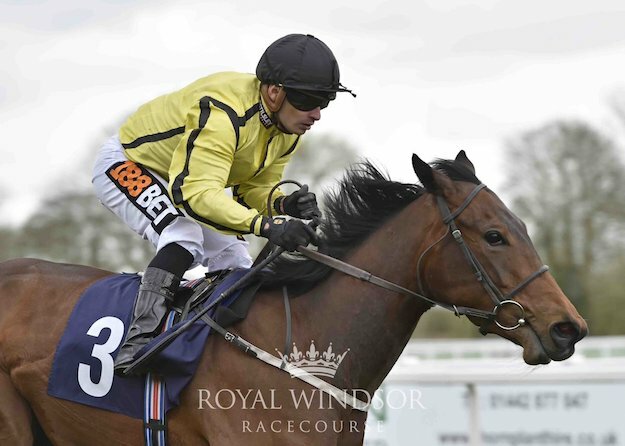 "Very pleased for the Parnership who enjoyed a lot of success with Opal Tiara and whilst WESTBROOK BERTIE may not reach her levels of success, he's shown he can mix it with horses rated around the 80 mark so he's no duffer. Silvestre gave him a very uncomplicated ride and he handled the ground. "Again he's a product of our breeding base at Norman Court Stud just down the road and his dam Evanesce only produces winners. Gill the Till is the mastermind behind BERTIE so well done to her in particular!" Lastly and by no means least it was Patrick Trant's BILLY RAY who took the third leg of the hat-trick in the Class 4 mile and a half maiden for three year olds. With Charlie Bishop up, the tactics were key in the heavy ground and whilst the field understandably tired in the closing stages, Charlie always looked confident in behind the leaders. Indeed, BILLY RAY was the last to come off the bridle and stayed on best of all inside the distance to account for the immaculately bred debutant Almoghared by almost four lengths with the weary rest a long way in arrears. Another Sixties Icon colt, although BILLY RAY is in stark contrast to the precoscity of KINKS. "He was never going to be sharp but this is a real stunner of a horse. A proper horse with size, scope and a real presence about him. I gave him a couple of runs at two because mentally he was such a backward slob that I wanted to switch him on. "That did him no harm and he hit the ground running this year, finishing second at Wolves when I really didn't know what to expect before proving that he could have a bright future after yesterday's win. "He's only rated 77 but I expect him to be far better than that in time. I'll eat my hat is he doesn't improve all year. He's gorgeous and a real slow burner who could be anything." 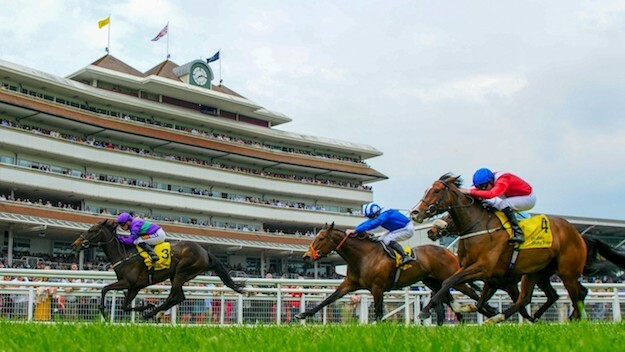 For many reasons, there's much to contemplate after DAN'S DREAM took one of the major 1,000 Guineas trial races on Saturday in the Group 3 Dubai Duty Free (Fred Darling) Stakes under Silvestre de Sousa at Newbury. 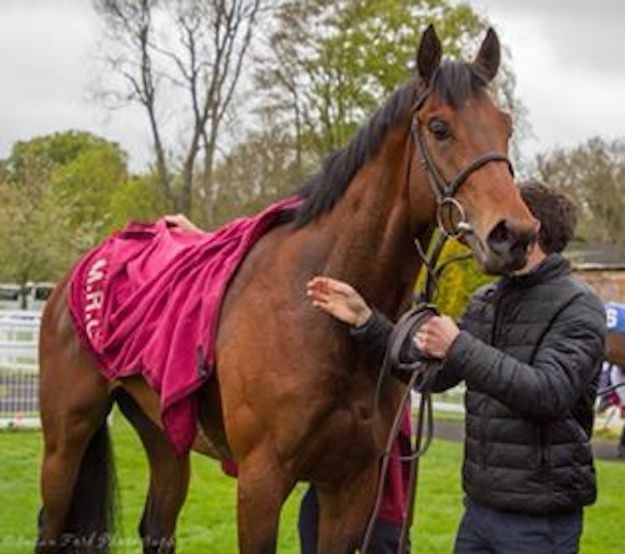 Racing aside, DAN'S DREAM is a somewhat special case (see link below) and although she's not in the Newmarket Classic at present, there is a lot for her owners led by Hunscote Stud's Steve Smith, along with Fred Watt, Simon Peckham, Sir Ian Botham and Gareth Edwards to ponder. A winner at Bath on her seasonal reappearance at the end of last month, Saturday represented a massive step up in class but it was one that Mick was typically not afraid of making. 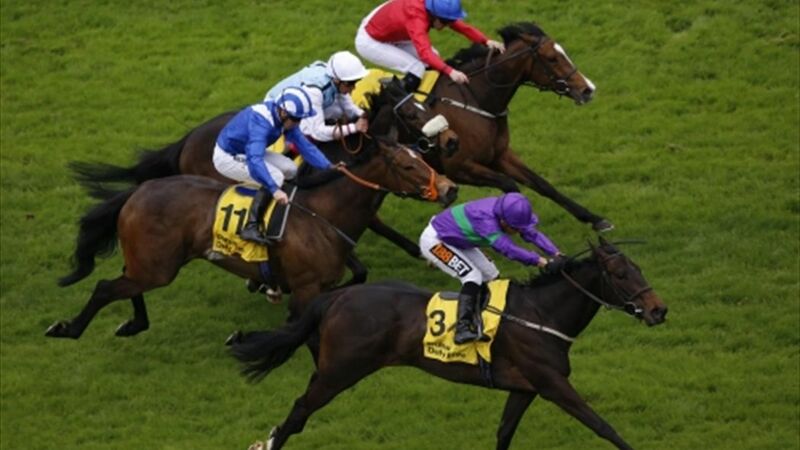 She travelled superbly in behind and once SDS pulled her to the near side as the race unravelled, there was very little doubt as to the outcome. The Cityscape filly came home very strongly in the good to soft conditions to win by a length and a quarter with the 102 rated Tajaanus, Dance Diva (98) and Hikmaa (101) in arrears. Even though she had race fitness on her side, that is undeniably smart form and Mick is now looking ahead with a filly he has always rated highly. "That's given Steve and his team something to ponder! I've left everyone well aware of my feelings, I want to supplement for the Guineas. She's got an entry in the Irish equivalent but from a racing point of view I'd like to go to HQ. "She is earning money for the Nicholl's Spinal Injury Foundation however so obviously that needs to be taken into account. It's a tough call and I've had my say so it's down to Steve and his team to mull over - it's thirty grand so I don't envy them. 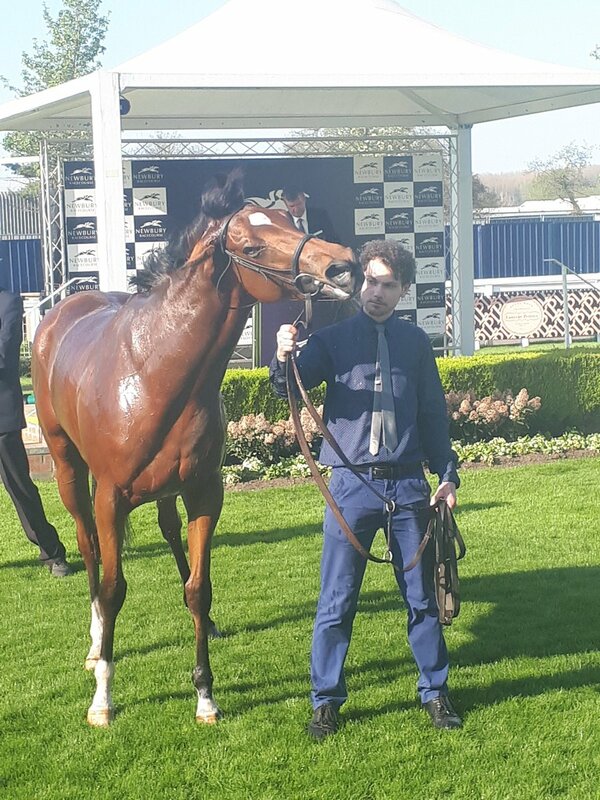 "She won a five and a half furlong race in modest company at Bath and this was a big leap forward but she saw that out well enough for me to believe that she'd get a mile at Newmarket, particularly with the ground drying up but I also understand the temptation to take her back to six furlongs for the Commonwealth Cup at Ascot. "Winning over seven on Saturday has us stuck in the middle of the two options but I'm all for Newmarket - Ascot comes late enough to go back to six if I'm wrong about the Classic trip. "We'll see though - she's a very good filly so it's a great problem to have!" There will be no smug one-upness in this news article. Zero, zilch, nada, nowt, nothing. A five timer is clearly something very rare and everyone involved deserves huge credit for all of their efforts in getting our horses ready at the very start of the turf campaign after a truly torrential winter. Spare a thought however for those of us who predicted yesterday's outcome to a couple of friends, yet declined to act upon their own convictions. There was a time when a five timer would have sent my mum to Mauritius. She's not even going to Margate this time around. Insignia Racing's DIAMOND DOUGAL, Khalid Al-Mudhaf & Mohammad Al-Qatami's ADORABLE, David Hudd, Chris Wright & Ann Black's KINKS, MRC's MARIETTA ROBUSTI and The Guest Family's CHARMING GUEST. 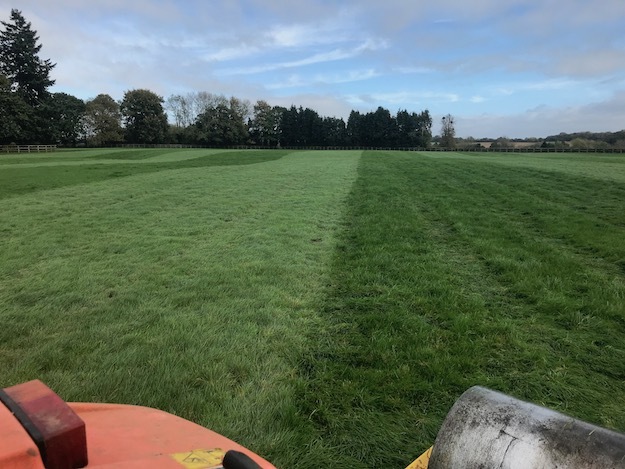 On a glorious spring afternoon, the first three struck in a frantic half hour period at both Bath and Newbury, during which I was chain harrowing the lower field at Norman Court Stud. 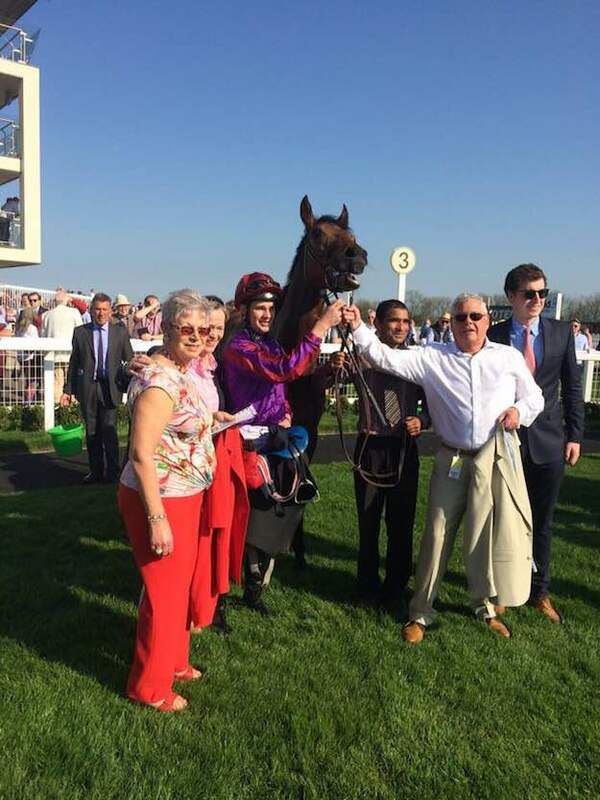 Insignia's DIAMOND DOUGAL made his racecourse debut at Bath's very same meeting as a juvenile twelve months ago and whilst he finished third in his maiden that day, the jarring conditions saw him away from the track until August. That setback however saw him truly flourish in the autumn, winning two races and being placed on three other occasions. Whilst he clearly benefitted from that enforced absence, he's certainly done well over the winter and took the Class 4 five and a half furlong three year old handicap in fine style under Charlie Bishop. Always in touch behind the leaders, he was asked for an effort at the two pole and extended away to win by over two lengths ahead of Bungee Jump with Big Brave Bob a further three lengths in arrears. Mick was delighted for all concerned. "That was brilliant for Tina Dawson and all of her members in Insignia. This is a very brave competitor who came right at the back end of the season and it was great to hit the ground running this time around. 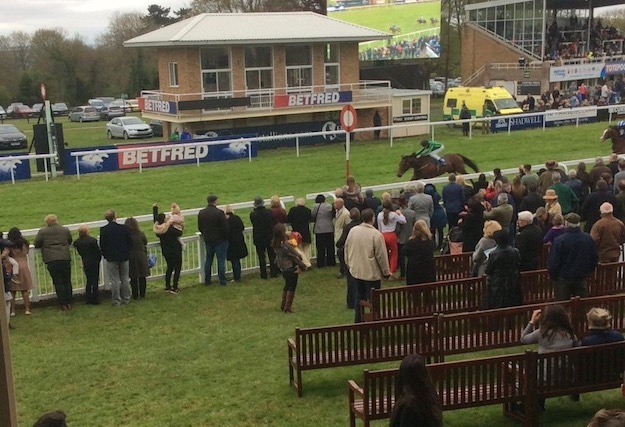 "The ground was perfect and he didn't half go well. He'll obviously go up from his current mark of 77 for that but as long as it's not firm ground I expect him to still be competitive in a higher grade because he's a very geniuine horse who goes to work every day with a great attitude." Next up was probably the yard's most eye-cathcing performance of the day as Khalid Al-Mudhaf & Mohammad Al-Qatami's ADORABLE hosed up under James Doyle to take an intriguing three year old fillies maiden at Newbury. 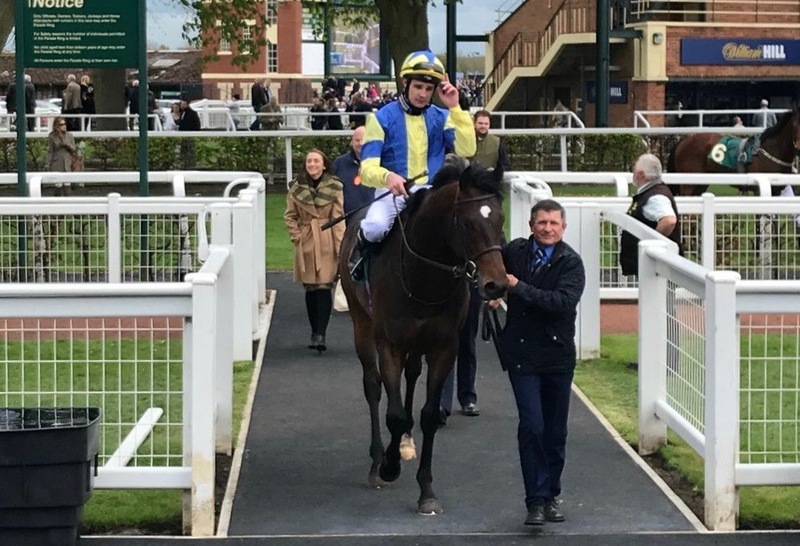 The well-bred daughter of Kodiac didn't mess around as the stalls opened in the seven furlong contest and set the pace throughout much of the contest in good to soft ground. 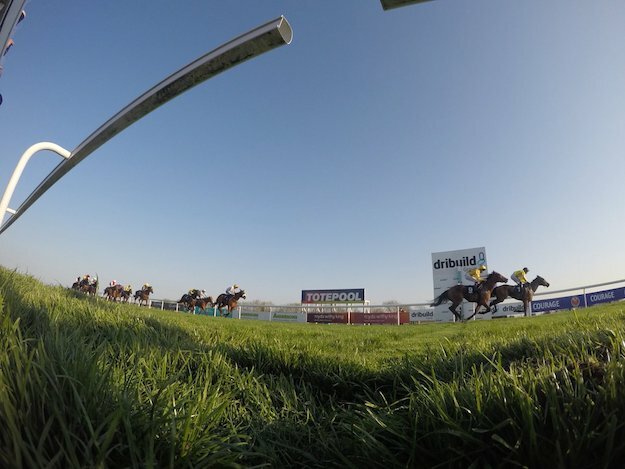 It was only at the two furlong pole that she came under pressure and although for a brief moment it looked as though the looming Solar Gold might test her, ADORABLE stretched again and went clear in convincing style to win going away by three lengths. She's the type of filly that Mick has always had a lot of time for. "This filly might just be a bit special. It's obviously very early days but the good ones you don't mind waiting for and that's why we gave her all the time in the world last year and didn't race her at two. "She always showed us that she was a good goer but at no point was I tempted to throw her in. I can't explain why, I just felt as though she'd benefit for the winter behind her. Anyway, without getting too excited, I really like her and that was a very impressive performance. She'll get a mile this year and we'll obviously be looking to pick up some black type. Her pedigree says she's decent and that's certainly what she looked yesterday." At around about the time of KINKS's victory in the juvenile novice median auction stakes at Bath, I was trying to extracate the harrow from under the water trough in the lower field, ironic when you think about it because that was the very same paddock that he spent his formative months at Norman Court Stud. Chris Wright & Ann Black's son of Sixties Icon did nothing wrong on his debut at Kempton two weeks ago, finishing second to a nice David Evans trained two year old but yesterday KINKS put his experience to good use as Charlie went forward from the gate and asked his charge to extend in the closing stages as the newcomer Tin Hat pushed him all the way to the line. KINKS battled on and always held sway although it wasn't easy as the official distance of a head indicates - we've had plenty of Sixties Icons through our hands at West Ilsley and KINKS looks fairly typical; good looking, tough and able to win at the minimum trip, with the predictable promise that he'll get further in time. Mick was delighted for all connections. 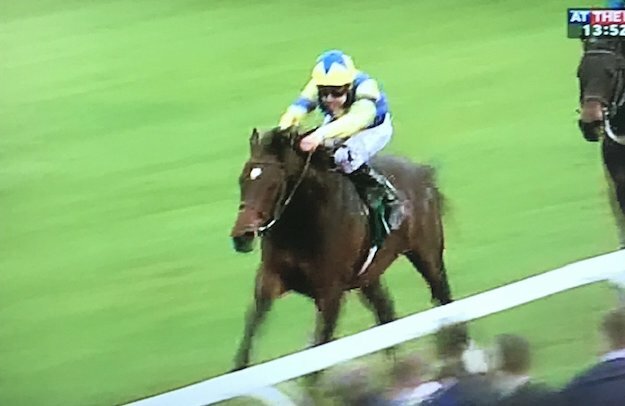 "Chuffed for David, Chris & Ann who have this lad as their second to year old winner of the year, having taken the Brocklesby and a similar event at Bath with IZZER. The KEMPTON race was very pleasing but I couldn't help feeling that KINKS was caught out that day as he was headed without having chance to respond. Yesterday though Charlie always had the revs up because by no means is he a sprinting type. He's an individual who will be a miler by the end of the season I'd imagine but he's got a great action and wants to get on with the job. "As long as they improve with racing, that's all I'm interested in but obviously we want to win along the way and this lad was always a smasher from the start. Well done to everyone at Norman Court Stud, they've done well - although the paddocks down the bottom do need rolling." 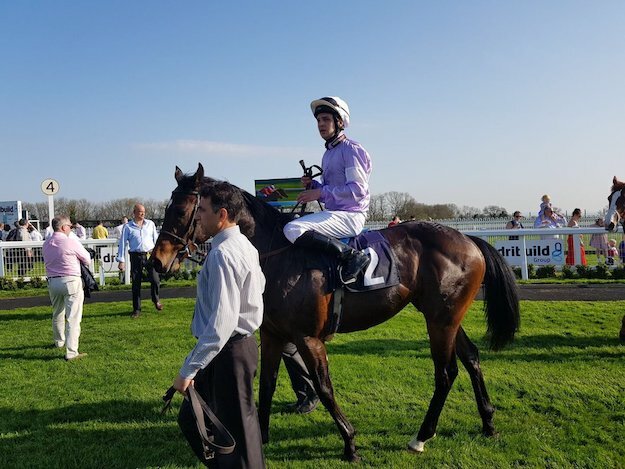 The next winner at Bath was MARIETTA ROBUSTI who backed up her win at Windsor on Monday to take the extended five furlong Class 6 handicap under both a six pound penalty and Silvestre de Sousa. In the knowledge that she's soon to go up in the weights, it was a question as to how well she'd come out of her Windsor win in bottomless ground but she soon showed that she's as tough as they come - in behind the leaders until push came to shove she took the race by the scruff of the neck up the rail to win by three parts of a length ahead of Ellen Gates. Mick was full of praise for the daughter of Equiano. "There's not much you can do but just say that she's an absolute cracker. She's no star but she loves her job and has come a hell of a long way since her debut in January. She'll go up next week and may find things get harder in loftier company but she's won three now and is all heart." The final winner came in the form of the Guest Family's CHARMING GUEST who took the five furlong Class 5 novice stakes under SDS on only her second career start. She made her debut at Ascot as a juvenile in May last year but returned with a fracture and was forced to take the rest of 2017 off. At that time she was one of the yard's shining stars on the gallops back home and it was a bitter blow to lose her for the season but Mick is convinced that there's more to come. "These things sometimes happen with babies and we were all gutted because she'd cost over a hundred grand and has a decent pedigree. There was little we could do except bide our time but she'd been great through the winter and that was the perfect reintroduction and she's battled home to win by a neck and fend off a favourite (Cowboy Soldier) with a bit of form behind him so that was a great performance in my eyes. "She's an interesting filly who will improve." So, whilst the water trough in the lower field has a sizable dent in it and some of us had only a mirror in the bathroom to reflect on with self loathing, for Mick and the team, yesterday was a very good one. "All I can say is well done to all of our winning owners and the team in the yard. These periods come in waves and just when you think it'll last forever, the wheels can quickly fall off so we just have to try and keep it going for as long as possible. "I can't say why we've started so well - we've always been behind since I've been at West Ilsley but we're in great form at present and I'm not going to pretend I know why, just keep things the same and try and enjoy them when they're going well. That's the key." From a personal point of view, Yours Truly lines up in the Southampton half marathon tomorrow. I'll not be having a bet on that either although I'll definitely come on for the run. 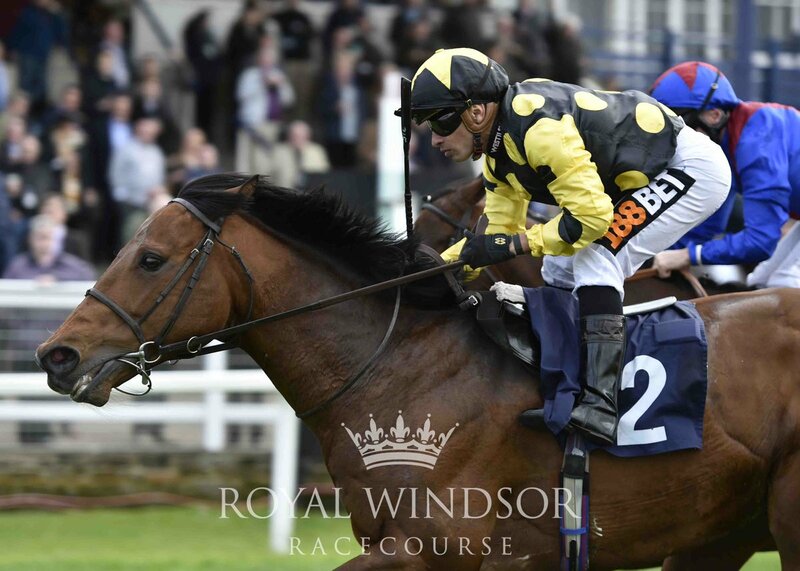 A double on Windsor's opening fixture of 2018 as Billy Parish's MOBSTA returned to winning ways and Mick's own MARIETTA ROBUSTI were both brought home by Champion Jockey Silvestre de Sousa yesterday afternoon. MARIETTA ROBUSTI was first up as the daughter of Equiano took her second event of 2018 in a hectic period that saw her only make her racecourse debut back in January. A winner at the fourth time of asking five weeks ago, she doubled up in handicap company by taking the Class 6 five furlong contest for three year olds only in very testing conditions. It was a ramshackle spectacle with all six runners spread across the course but she won convincingly and was clearly aided by the withdrawal of G Eye Joe after an incident in the stalls and, with a target of the early leader Give Em A Clump to aim for at half way, SDS asked her to assert her authority and she powered home to prevail by a convincing five length to Mick's obvious delight. "She's clearly very tough because that was her seventh start of the year and her debut on turf which was on the heavy side of horrible but she saw it out well. "We just couldn't get her going as a two year old because she was constantly being stopped with niggle after niggle but she always showed ability and hasn't disappointed this time around. "I don't know what the handicapper will make of her because it was a real mess of a race in such dreadful ground but I'm sure she'll go up from her current mark of 65 and we'll just have to see what we've got to work with when that happens. "We've got her in at Bath and Nottingham this weekend for just that reason and we'll see how she is in a couple of days before committing to those options." MOBSTA took the feature race, the Class 3 Windsor Sprint Series Handicap to vanquish the torrid memory of his last outing at Doncaster. He was brutally unlucky that afternoon as Silvestre found himself very short of room in the closing stages to the extent that he clipped heels and was almost brought down. Amazingly he still stayed on strongly to finish fourth but things went far better yesterday as he delivered a withering run in the closing stages to come home ahead of Glory Of Paris by a slender but convincing neck. Mick was pleased to put the memory of Doncaster to bed. "This lad hasn't had the best time of things for a good while now. He's a Group winner who has tumbled down the handicap since that win back in 2016 so you'd say that he had every right to win in 0-90 company. "Silvestre was bitterly disappointed at Doncaster, as we all were, but we've put that right now and I feel that he's a horse with a real hunger once again. On his day, with the ground in his favour, he's a relentless grinder over this kind of trip and when things fall right he's a real threat. "We've had to wait for him but, fingers crossed, he's turned a corner." 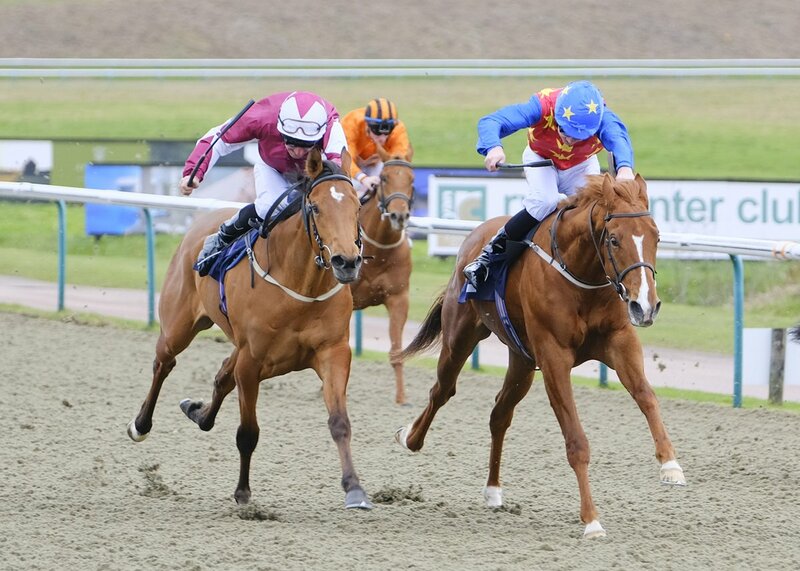 Perhaps an indication that a first season sire might be a little bit special at Lingfield yesterday as Theresa Burns's JUNGLE INTHEBUNGLE landed the novice median auction under Charlie Bishop. A son of Bungle Inthejungle, JUNGLE INTHEBUNGLE is out of Princess Banu and both sire and dam were trained by Mick at West Ilsley. Clearly the pair have passed on plenty of their speed and precocity to JUNGLE INTHEBUNGLE who travelled very well throughout yesterday's contest and despite the inevitable greenness, he managed to stick his head out close home to hold off the concerted efforts of Lady Prancealot and prevail by a short head. That means that we currently boast a 100% record with our two year olds and although it's very early in the season, Mick couldn't be happier. "IZZER has already indicated that we might have a good bunch of juveniles and this lad is in a similar vein. He's strong, athletic and mentally bombproof and was very much ready for a trip out of the yard. "A few years ago I'd have said the same about his sire but things didn't go to plan for him on debut but he more than made up for it from then on in. "He was a remarkable racehorse with the sort of exuberance that you'd hate to stifle and once he got going he was the quickest thing I've seen. A monster of a two year old and a great mentality - that's what JUNGLE INTHE BUNGLE has too. "Princess Banu was similar in that you didn't complicate matters with her and it'll be interesting to see what happens to this lad as the season goes on. His dad won the Cornwallis and the Molecomb and you'd like to think his son could do something similar. "That is obviously all pie in the sky until the season settles down and a pattern starts to emerge in terms of form but I'm delighted for Theresa, Maurice, Madeline and the whole team who bred him at Rathasker Stud. "We've a few Bungles this year and it's very exciting for all concerned."